Positive muons implanted in metals tend to stop at interstitial sites that correspond to the maxima of the Coulomb potential energy for electrons in the material. In turns the Coulomb potential is approximated by the Hartree pseudo-potential obtained from the GPAW calculation. A good guess is therefore given by the maxima of this potential. In this tutorial we obtain the guess in the case of MnSi. The results can be compared with A. Amato et al. [Amato14], who find a muon site at fractional cell coordinates (0.532,0.532,0.532) by DFT calculations and by the analysis of experiments. Let’s perform the calculation in ASE, starting from the space group of MnSi, 198, and the known Mn and Si coordinates. The ASE code outputs a Gaussian cube file, mnsi.cube, with volumetric data of the potential (in eV) that can be visualized. The parameters after -c are the potential values for two countour surfaces (the maximum is 13.4 eV). This allows also secondary (local) minima to be identified. The absolute maximum is at the center of the plot, at (2.28,2.28,2.28), in Angstrom. 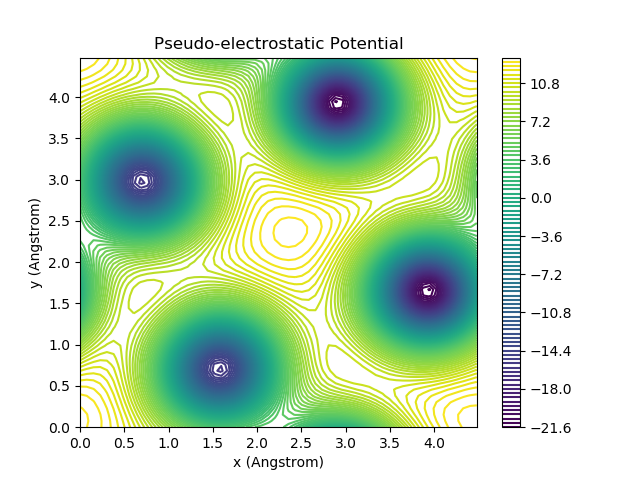 A local maximum is also visible around (0.6,1.75,2.28), in Angstrom. In comparing with [Amato14] keep in mind that the present examples has a very reduced number of k points and a low plane wave cutoff energy, just enough to show the right extrema in the shortest CPU time.